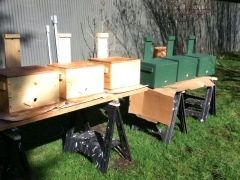 After reading McCartney Taylor’s book “Swarm Hives and Bait Boxes” I got excited about building my own. I don’t want to be on a swarm hot line list because it’s hard for me to drop everything to chase one down, I’m going to try my luck in capturing some. The whole idea is to place the box where the scout bees will fly by/over it. Then when they sniff the essential oil, they’ll wheel around and see how spacious it is. Then go back and do their waggle dance to advertise their find. I’m hoping by placing 8-10 of these bait boxes, I’ll be able to catch 3 swarms. Here are six boxes of them built ready to hang. Hope I can find enough friends who will let me hang them on their properties.